I like to think that it’s not the hype getting to me when I talk about Sword Coast Legends. When I first saw the demo of the game at E3, I was very intrigued. Here at PAX Prime, though, I’m actually able to sit down and play the game for real — well, as real as a 15-minute demo will allow. Maybe I’m jumping the gun, but Sword Coast Legends is the Dungeons & Dragons game you’ve been looking to play for the last decade. I think every D&D video game player has hopped into Dungeons & Dragons Online or Neverwinter and hoped that it would give them the same experience that they had either from playing the tabletop game or Neverwinter Nights. Given the longevity of BioWare’s D&D opus, I don’t think any game will take its place in our hearts, but n-Space‘s version of D&D might find a place right underneath it. In a conference room outside the main PAX show floor, the developers at n-Space sat me down in front of a character select screen with a dozen or so pre-made avatars. Of course, were this the full game, I’d be able to customize my character the way that I liked. But this being a demo, I’m sure they didn’t want me to spend the whole time just making a character. And I could. So I naturally picked the female dwarf with a shield and flaming sword. The other characters where manned by press, except the Cleric (or “pajama cleric” ) who was controlled by Narrative Director Jay Turner. If this is the first time you’ve heard of Sword Coast Legends, then let me give you a super brief summary of the game. The idea is to recreate the experience you have playing D&D with your friends on a tabletop, but in an action-oriented video game. So the dungeons and campaigns consist of five players. Four act as the party joined together to tackle the dungeon and the fifth is, of course, the dungeon master. Up to this point, we’ve seen multiple demos of the game from the DM point of view, and that is clearly a major feature of the game. But for the game to be good, it has to be good from everyone’s point of view, which is why I opted to play a party member this time around. The controls where not what I expected after seeing the demos. I thought they would have been more like MMORPG controls, but they actually function more like MOBA, or duh, a dungeon crawler. WASD controls the overhead camera, you click to move, and the middle mouse button will spin the camera. If you click on an enemy you will perform a default attack, but your number keys (and your – and = keys) perform specials including attack abilities, defensive abilities, active search, and stealth. If there are ultimate abilities or anything along those lines, I didn’t see them, but that might be because I was playing a level-6 character. I was told that my warrior would gain an AoE at level seven, but I didn’t have one to start. Considering that we were playing against a DM who was also a player that hadn’t seen the game before, the experience was understandably simple. Most of the enemies were the poke-them-until-they-die variety, but given that each enemy has its own range of tools and abilities that the DM can control, the potential for interesting combat is definitely there. 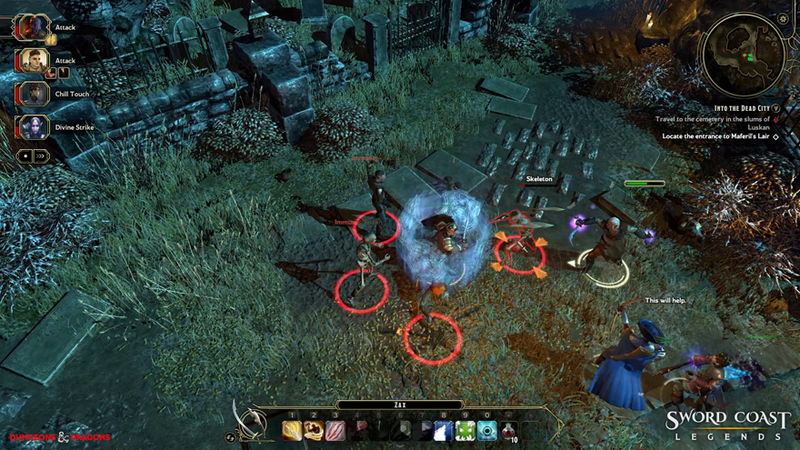 Like many video games, a large focus is on combat simulation, but there are many DM and player tools that focus on treasure hunting and storytelling, too. And depending on the DM, the focus of the dungeon could be more than just whacking away at spiders. In fact, the game mechanics are designed to encourage DMs to make campaigns fun for parties. As the party successfully completes tasks in dungeons, DMs gain “threat” which increases the number of things that a DM can do. And as it so happens, we had a complete party wipe when our DM threw too many elite-level mobs at us. Player deaths actually decrease DM threat. The ultimate goal is to encourage fun, not necessarily make things super difficult for party members. All right, what’s the cost? At this point, you might be wondering how you can get your hands on this game, and you’re probably also thinking that this game will be full of microtransactions and other ways to nickel-and-dime you. I can’t say that won’t happen in the future, but Turner explained to me that it isn’t in the plan to have a cash shop. They might have future DLC, he said, but it will feature substantial amounts of combat. Currently, the game is available for preorder, either through the official website or through Steam. Given the recent negativity surrounding preorders, I cannot say that you must preorder it (even though it does include the Rage Of Demons DLC Module for free), but at $34.99, this game is on my must-buy list when it launches on PC, Mac, and Linux on September 29th. Maybe I’ll see you in one of my dungeons. Massively Overpowered is on the ground in Seattle for PAX Prime 2015, bringing you expert MMO coverage from NCsoft, Trion, PWE, and everything else on display at the latest Penny Arcade Expo! Take it with a grain of salt. It seems to me that the major selling point is the custom DM mode, and not the single player campaign, so keep your pants and don’t start thinking you will experience some epic Baldur’s Gate style single player game. Odds are the single player will be diluted and shallow and just an excuse for D&D fans to try the game and stay for the multiplayer. At Pax, the devs skilfully avoided to discuss the single player and focused the interview entirely on the multiplayer part. Like I said, expect a shallow and short single player campaign. FeveredDreamer mmmm, Neverwinter Nights. I remember playing on the World of Caenyr persistent world all the time. Good times. Good times. 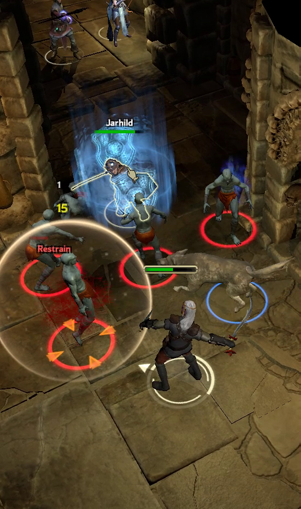 RE: Sword Coast Legends, looks fun, but I’m a bit disappointed with them leaving out half the core classes… Why are so many D&D games doing that lately? So I’m both an MMO player and a D&D nerd, game with my tabletop friends at least one-two times a month and yet this seems pretty awesomely uninteresting to me. While I definitely get that this will be right up some folks’ alleys I’m suspecting it’ll be much more the old Neverwinter Nights type crowd than anything to do with MMO players. Agreed. GoG.com really needs to get this game. People have played spammy, cool down infested action combat for so long, they’ve forgotten that D&D (forget 4th ed) is about limited spells, tactical combat, and NOT cure light wounds as a mashable button. You need to actually think about when to use that fireball since you only get 1 before a rest, magical heal potions aren’t just laying around in every nook and crannie. Blinkenn Sigbjorn Actually, if you pre-order, you get the Rage of Demons DLC for free. That said, based on that, you are correct about them charging for additional seasons content. I’m actually okay with that though, as it would be new content, rather than stuff cut out of the game originally. God I want to play this *now*. This might be the game Im looking for. Tried playing Roll20 and other Virtual Tabletops but that wasn’t for me. Too slow and tedious and the game I did play there was no visuals other than the character sheet I rolled. This games looking good. For those who lament the lack of actually challenging PvE content and the death of grouping and socializing in MMOs, this well could be the “MMO” that you have been waiting for. Take your favorite MMO, rip out all of the tedious and grindy “solo” game, keep the group oriented parts that you love, and add a whole new way to make “PvE” fun and varied . . . the result might look an awful lot like this.